Genesis 2.1 was released a week ago, and Genesis 2.1.1 followed a day later. 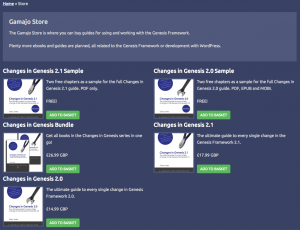 As I’m in a privileged position to see a list of all the changes in Genesis 2.1, I’ve written them up in a new guide called Changes in Genesis 2.1. Changes in 2.1 give detailed explanations, screenshots and code snippets for 84 changes in 2.1.0 and a further four critical fixes in 2.1.1. This is the only resource where these changes are detailed. This is the second in the series, after my previous guide, Changes in Genesis 2.0. This listed a total of 151 changes covering 2.0.0, 2.0.1 and 2.0.2. Some folks want advanced customisation books, some want it from the basics! More books are definitely planned.